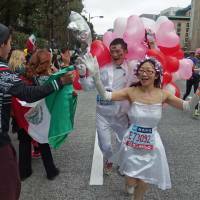 February in Tokyo is the season for running as thousands prepare for one of the world’s major sports events: the Tokyo Marathon. A record 37,000 runners plan to take part in the race on the last Sunday in February. The race marks its 10th anniversary this year. Kyodo News journalist Ikuo Tatsumi, 55, has captured most of the races, although none was a work assignment. An amateur runner, Tatsumi has completed numerous races nationwide, from Okinawa to Hokkaido, and has run in more than 70 marathons worldwide. He has done the renowned New York, London and Berlin marathons and has run the Tokyo Marathon most years since it began in 2007. He missed it last year, for example, when he failed to win a place. “I apply every year but this time I was unlucky,” Tatsumi said. He runs with a camera and snaps pictures of other runners, spectators and supporters — all that constitutes the festivity of the event. Some of his photographs have been exhibited nationwide and compiled in a book titled “Hashitta! Totta! Sekai no Marason” (“I Ran! I Shot! The Marathons of the World”). 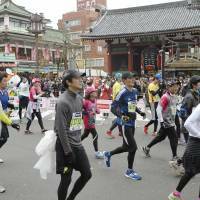 When Tatsumi began running over 20 years ago, Tokyo had no international marathon for amateurs. “I regretted I could not tell other runners I met abroad ‘come to Japan and join me in the race in Tokyo,’ ” Tatsumi told The Japan Times. In 2001, he and other marathon aficionados launched a citizens’ running event in Tokyo named the Yumemai Marathon. This, he said, was a driving force for the launch of the Tokyo Marathon. Organizers say the race is so oversubscribed only a tenth of nonprofessional applicants secure a place. Runners compete in several categories: Elite runners are likely to finish the race in around two hours, but after them come categories such as those who did well in nationwide races, disabled wheelchair users, and charity runners raising money for good causes. 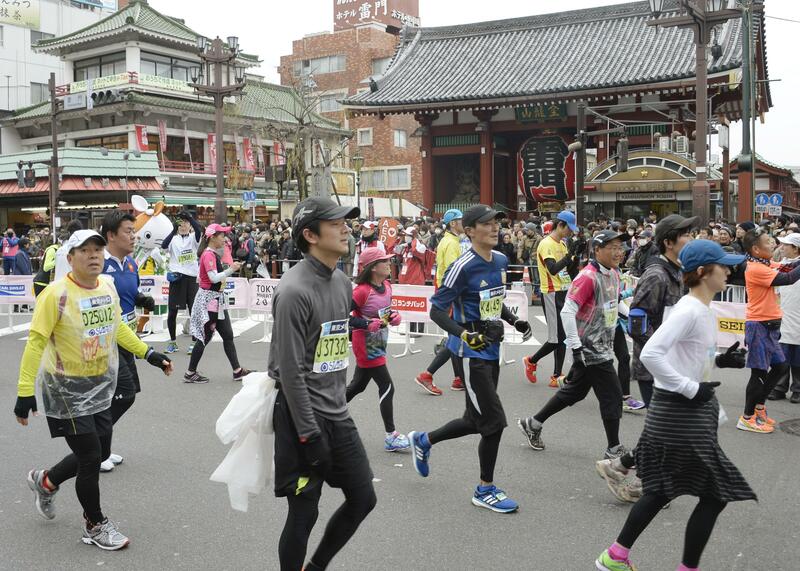 Tadaaki Hayano, race director of the Marathon Foundation organizing team, said the Tokyo Marathon has always been popular with amateur runners. However, it took time before the newly inaugurated race became recognized as a world-class event. “Elite runners’ finishing times were too slow, and we lagged behind other major races,” Hayano said. 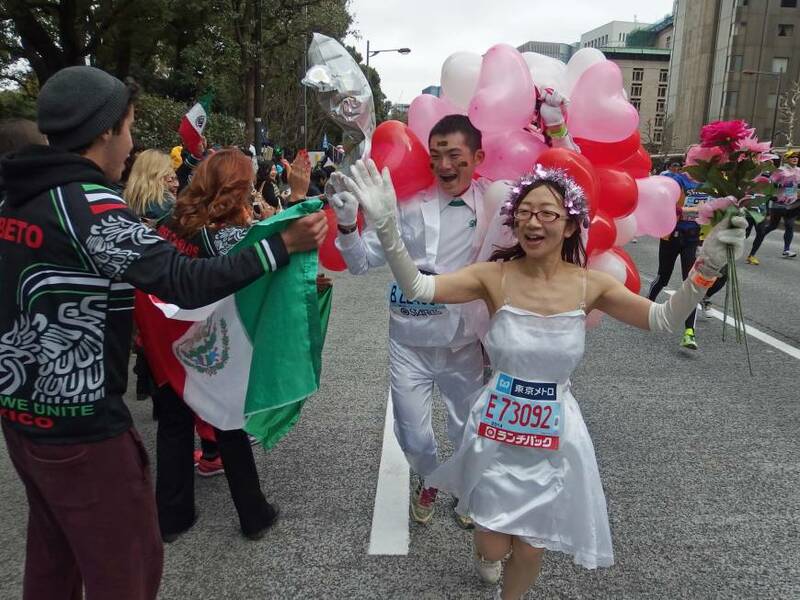 In 2013, the Tokyo Marathon was approved as a member of Abbot World Marathon Majors, a marathon grand slam series where participants compete in six cities, starting in Tokyo, followed by Boston, London, Berlin, Chicago and New York. The organizers were required to step up security after a bomb attack near the finish line of the Boston Marathon the same year, which killed three people and wounded about 260. They have introduced squads of police, medical doctors and relief teams of runners with first aid and portable AED equipment in case of heart attacks. This has added up to the Tokyo race’s reputation as a well-organized and presumably the safest such event, which now draws attention and new participants from overseas. “This is what we are really proud of,” Hayano said. Also, the course has been designed down to the smallest detail — downhill at the start, mostly flat in the middle and slightly uphill on the final stretch — which sharpens the competitive aspect. Organizers are committed to ensuring that participants keep to the route, with signs in English, Korean and Chinese and multilingual volunteers on hand. Supporters cheering from the roadside can see the race pass sightseeing spots such as the renowned Kaminarimon gate of Sensoji Temple in Asakusa, Tokyo Tower in Shibakoen and the Kabukiza Theater in Ginza. But running photographer Tatsumi believes the course could be better designed, as several kilometers of the route are repeated when runners loop back along roads they have just run. He wishes spots such as the Rainbow Bridge were included. “But what makes the event special is the support that never ceases,” said Tatsumi. “I think the race has gained recognition as a . . . major festival, something beyond a sports event,” Hayano said. At 28 points along the route runners are entertained by dance or musical groups approved by the metropolitan government, the co-organizer of the event. Roadside supporters encourage runners by holding up banners. “I remember I felt so moved when I saw a sign near the finish line that read ‘Your feet don’t really hurt!’ I felt cheered on from people who don’t even know me,” said a 25-year-old female public relations worker, who took part in the 2012 race. In fact, 62.6 percent of the participants in the 2015 event said the festive atmosphere was the reason why they applied. When the race starts, Hayano is at the front, riding a bike next to the marathon’s official pace-setter. He recalled the starting signal inaugurating the first race in 2007, when the sight and the roaring sound of runners pounding the streets brought tears to his eyes. When the race first started, he recalled, organizers budgeted for 30,000 runners. “We weren’t sure if we would be able to gather so many,” Hayano said. The target was easily met. For him, the best prize would be if the Tokyo Marathon becomes known as the world’s best a decade from now.